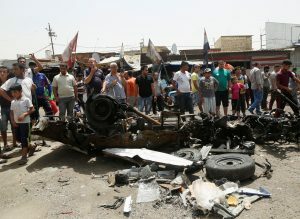 Iraqi officials say the death toll rose to 63 people after a car bomb detonated in a crowded Sadr City street market in Baghdad Wednesday. The Islamic State has taken responsibility for the attack in the Shiite neighborhood, the Associated Press reported. At least 85 people were wounded after the attack, and the death toll may continue to rise, according to the Associated Press. Earlier reports said 45 people had died.